You spend just as much time, if not more, with the people you work with as you do our families and friends. When it comes to the workplace, understanding your fellow employees, how they think and why they think that way can make communication easier. These team building games are designed to help you get to know your fellow workers, your team of employees, and yourself a bit better so that you can all work together more efficiently. Please note, these are only ideas, and can be modified to fit your workplace. Place a large, blank scrapbook or journal in the common area. You could even fill it with prompts, asking participants to follow suggestions for their submissions if they’re having a hard time deciding what to write themselves. Keep pens, markers, decorative tapes, glues and whatever else you can think of close to the book and encourage team members to write, paste, and cut the book to create a living history book for your business and those that help keep it running. Once the book has been filled, keep it safe and get a new one. Give every player for four sheets of paper. On each sheet, have them write one lie and three truths, so that each piece of paper has one thing written on it. Please note these should be believable lies and the mood should stay professional. Once everyone has their list, ask each member to read their truths and lies out loud in a random order. The other participants must try to guess which of the four statements is the lie, and why. Ask each team member to bring one object from their desk. Using this object as their product, they must create a logo, marketing plan, slogan and whatever else you can think of. Set a timer, then ask them to give a presentation on their new product to the rest of the group. Afterwards, have everyone discuss which product presentations were the most successful, and why. This is one of the team building games that is great for building communication skills. Divide up teams of two and have the players sit back to back. One team member will be given a picture of an object or word. Without saying what it is, the person must describe the image, without using words that will directly describe the subject. For example, if the image given was a lion on a unicycle, the person may describe a large, furry creature with big hair above a small wheel. Come up with a fictional problem that your team must solve. This can be something simple like a riddle, or something more complex. Present this idea and have the group come up with a simple two to three sentence answer on a blank piece of paper. Next, have each member pass the sheet to the left and ask them to use the idea to create a new solution. Continue the pattern for a few rounds and see what the final results are. Divide your team into groups, then tell them they must find one thing they walk have in common. This can include hobbies, music tastes, favorite food or even the last movie they have seen. After they have settled on their common thread, ask them to create a short list of traits or stereotypical qualities of people who share that trait. The group must then take on the qualities of that stereotype for the remainder of the meeting. For example, if everyone in a group found out they had cats, they may all periodically ask members of other groups to view photos of their cats. After the meeting is over, discuss how silly stereotypes can be and how they narrow our vision of others. On the floor, create a large, enclosed polygon about twelve feet or so long by seven feet wide using making tape. Try to shape it with the thought that people will be making their way from one end to the other. Inside the polygon, place some squeaking dog toys, and twice as many sheets of paper (or paper plates). The papers act as landmines. This is one of the team building games where the goal is for pairs of two to make it from one side of the polygon to the other, blindfolded, using only the vocal guidance of the players on the outside of the shape. If a player steps on a mine, they become frozen, and must wait for the other player to step on a dog toy to continue. If both players become frozen, the team must restart. Create a challenge of some sort for your team to tackle. This could be sending an email without touching the keyboard/mouse or making an innovative package concept, the choice is yours. Divide into even groups, give each team the same set of supplies, and instruct them to solve the problem using only the supplies given. Once the time limit is up, have each team reveal their creations. This classic team building exercise encourages team work and creative thinking. Put together a list of items for your team members to find. This can be done individually or in small groups. The first to collect all of the items and bring them to you, wins! For an extra layer of difficulty and problem solving, instead of writing it the items themselves, write clues, simple descriptions or riddles. Produce several scenarios in which someone may be chosen to complete a job or task with your team or for another situation. For example, in one scenario you may be looking for a partner to help complete an important product presentation, and in another you may be describing a potential spouce. Each person must come up with just ONE question to ask in order to determine whether or not the hypothetical person in question is right for the task. This exercise helps people understand how differently, and sometimes similarly, everyone thinks. Arrange a collection of random objects: the fewer apparent connections they share, the better. Divide into groups and ask each team to categorize the items into families. Each team writes their categories on a sheet of paper within a given time frame. After time has run out, each group will present their lists to the other teams, and reveal why they grouped the items in the way they did. This is one of the team building games that is great for an ice breaker. Have participants close their eyes and think of their first and fondest memories. Give them a few moments to think, then ask them which memory they would want to relive if they had thirty seconds left to live. Then, ask everyone to share what their choice was, and why. Another classic activity, this team building game requires two or more teams to attempt to build a package that carries an egg safely to the ground after a drop from a window or rooftop. After completing the package, each team should give a short presentation exposing why their package is unique and why they feel it will safely carry the egg to the ground. After, drop the eggs and see if the designs work! Break everyone up into groups of four or five. Each group acts as though they are stranded in the arctic. Each group must elect a leader and erect a shelter in order to survive. The catch is, the leader is suffering from frostbite and cannot physically help in building the shelter. And the other team members are suffering from snow blindness and must be blindfolded. The leader must describe how to build the shelter and the team must do so without being able to see. This team building exercise is very simple. Before your next meeting, act excited, like you’re going to be giving big news. Next, simply stop taking, and remain silent for about a minute. Take notice of how people react, who seems to get nervous as the silence goes on and who feels comfortable. Once the time is up, ask everyone what they’ve learned in the silence. Divide into pairs and ask each group to explain what they would do if they had a month to do whatever their heart desired, with an unlimited budget and freedom from everyday routines. After each group has exchanged their ideas, the opposite person must describe the trip of their partner as best they can. For this exercise, tie the ends of two pieces of string around the weaver of a pencil. Pair your team up into groups of two, and tie the other end of the strings around each team members waist. Have the teams stand back to back and attempt to lower the pencil into a soda or water bottle on the floor below. This team building game requires a bit of physical activity. Divide into two groups. Using a rubber chicken (or any other equally ridiculous rubber object), Team A throws the play item as far as they can, and Team B must form a single file line from the item to the starting line. They just pass the item, using an over the head, between the legs alternating pattern until it reaches the starting line. While Team B attempts to reach the starting line, one member at a time from Team A must run laps around the line made by the other team. Each person that completes a lap scores a point for their team. Repeat as many innings as seemsappropriate with your group. 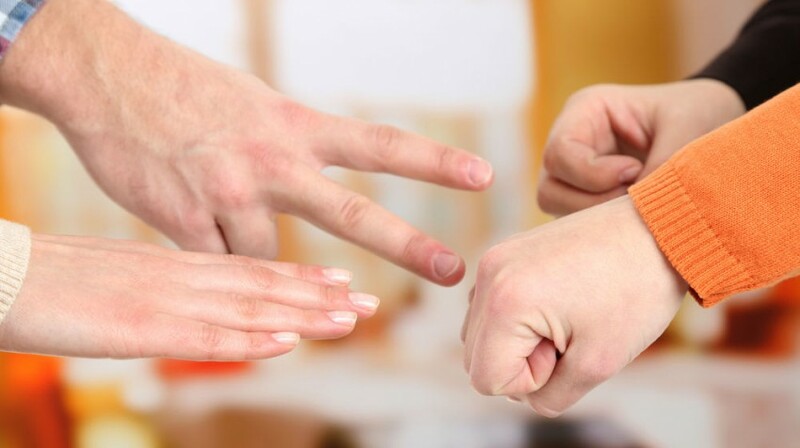 Much like the classic rock, paper, scissors game, each player chooses between three poses. Bears eat ninjas, ninjas beat up cowboys, and cowboys shoot bears. Each player either roars for bear, shoot finger guns for cowboys or strike a ninja pose. This is a great team building game to get everyone to let loose and get a little silly. Create a bunch if cards with Xs and Os on them. The Xs represent clucks, and the Os stand for claps. Shuffle the cards and arrange them so that the entire group can see them. Lead them through the pattern first, keeping a steady pace and getting them comfortable with the arrangement. Repeat the pattern again, faster, and finally instruct the group to attempt the pattern in unison, on their own, even faster. Then, divide the group into two groups and ask them to try again. Using a strong rope and a sturdy branch, tie a tire (PDF) about five feet from the ground. Secure it so that it doesn’t move around much. The goal is for everyone to work together to pass one another through the tire as quickly as possible, without touching the sides. Instruct the group that they must come up with their own strategy for getting everyone safely through the center. Place a large sheet on the floor. Have everyone stand on the sheet, then have them attempt to turn the sheet over without stepping off. The only rules: no one may step off the sheet, and no carrying other people. Much like the classic road crossing game, this team building exercise involves trying to make it from one side of the ‘river’ to the other. Using paper, cardboard, or whatever is handy, create a path of ‘lily pads’ from one side of the river to the other. Participants must stay in contact with lilly pads at all times or risk them being swept away, or removed from the playing field. The goal is for everyone to reach the other side as quickly as possible.